For those not familiar with Parliament Hill – the name is on the tin – it’s steep hills and often slippery /very muddy. Generally, we would suggest long 12/15 spikes, and duct tape. Bring spare footwear, full set of clothes, bin bags, and wet wipes – especially if you are getting the train home! 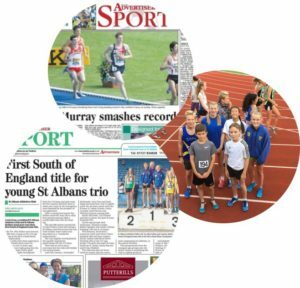 All U17 & younger members must run in the current design St Albans AC vest and all older runners must be in the St Albans Striders vest. It’s an iconic course – so please do bring your cameras and share any suitable photos. Please be at the tent a minimum of 1 hour before your race time to collect your number and familiarize yourself with the course. It can take a good 15 minutes to walk to the race area / tent and the toilets tend to have long queues so please allow sufficient time. Could Could supporters please help with erecting & dismantling the tent and registration please. * If you were 20 between 1/9/18 – 31/12/18 you are in the U20’s Race! From St Albans it’s probably easiest to get off Thameslink at West Hampstead and transfer to Overground Service to Gospel Oak – walk 2 mins. Gospel Oak is less than 400m from the venue. If you are travelling to Kings Cross or Euston you can get to Parliament Hill via Bus or Underground Train. The 214 Bus route goes from Kings Cross Station to Highgate Rd, near Parliament Hill every 10mins, this journey takes about 30mins. Other bus routes stopping at Highgate Rd include the C2, Liverpool St to Parliament Hill and the C11 which comes from Brent Cross where there a large Shopping Centre and Car Parking. Underground Stations within walking distance of Parliament Hill are Tufnell Park less than a mile away and Belsize Park about 1-mile walking distance. These are both on the Northern Line and can be got to from any of the main railway stations in London. Kentish Town Station is only a 15-minute walk from the venue & Hampstead Station is 20mins walk. Parking at Parliament Hill Fields – Hampstead Heath, North London is limited so please allow plenty of time. There are two car parks, available for the general public, one is at the bottom of East Heath Rd (approx. NW3 1BP) and the other is at Jack Straws Castle (NW3 7ES) at the top of the East Heath Rd. They both hold a maximum of 200 cars. Side roads around Parliament Hill Fields are busy and in general residents parking only, so to help you we list various routes and ways to get you to the venue.